Over 35 years ago, Carl Countryman started crafting custom gear for touring rock bands and performers. Today, the Countryman family business is an industry-leading manufacturer of legendary direct boxes and ultra-miniature microphones, with the same goal of serving audio professionals all over the world with personal attention and exceptional quality. Countryman’s wide range of direct boxes and highly customisable earsets, lavaliers, instrument, hanging, and podium microphones are all designed, manufactured, and rigorously tested at Countryman’s headquarters in Menlo Park, California. 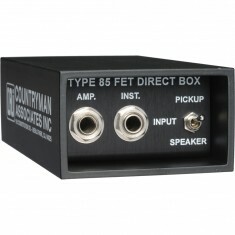 Mic Hire stocks the Countryman Type 85, a compact direct box that connects instruments with high impedance pickups, such as piezo pickups to a balanced XLR type microphone input.